Since I haven’t posted anything on the Secret Garden embroidery project lately (I haven’t been home for the last couple weeks – did you miss me? ), today I want to share with you someone else’s Secret Garden project. My reason for honing in on Lynette’s version of the Secret Garden Hummingbirds will be obvious once you see it! Here, you’ll see a completely different, really fun approach to the Secret Garden project. Besides a new color scheme, Lynette has incorporated different stitches into her project and several types of beads. To fill the flowers, she worked from dark to light, from the outside in, embroidering in heavy chain stitch. Then she topped each petal with a contrasting colored teardrop shaped bead. 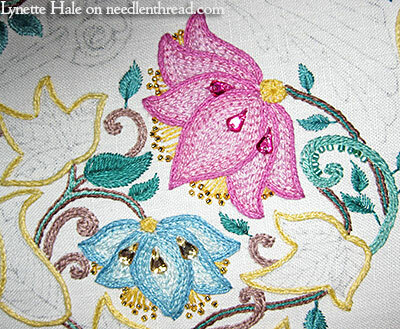 The pistils on the flowers are worked in straight stitch, topped with seed beads. I love the way the flowers came out! For beginners especially – and for those who don’t like the seed stitch filling topped with satin stitch on my version – chain stitch makes a lovely filling! You could work heavy chain stitch, like Lynette did, or you could work just regular chain stitch. The dark to light progression on the petals keeps them separate, but adds a sense of dimension to them at the same time. And the contrasting teardrop beads are a brilliant idea, for the teardrop shape in the middle of each petal on the original design. Lynette embroidered the vines in stem stitch in a combination of browns and teal greens. She used seed beads long the vines, too. Some of the leaves on the project are worked in long & short stitch and some are worked in satin stitch. For most of the project, Lynette is using two strands of floss in the needle, except on some of the tiny leaves, where she’s used one strand. So there you go! A completely different approach to the Secret Garden project – fun colors, fun stitches, lively, with lots of sparkle and personality! The piece is beautifully stitched, and I can’t wait to see what Lynette decides to do with the birds! 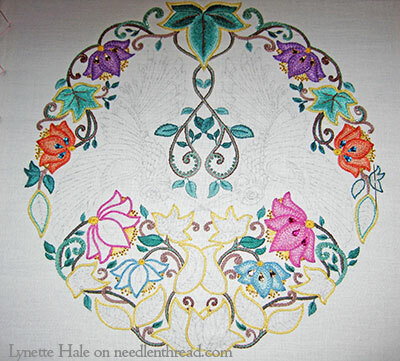 You can find photos of Lynette’s progress on the Secret Garden project on the Secret Garden Embroidery Flickr group, along with several other stitchers’ photos, all of which have something to offer as far as inspiration goes. It’s so fun to see everyone’s progress! Oh, that’s so lovely! Well done, Lynette! Wow Lynette! I love the colors, but I can’t get over how you’ve gotten those beads all perfectly placed. The effect is stunning! Great work! I did miss you a lot, I hope you had a great time where did you go? 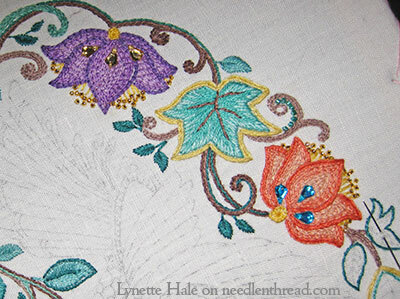 Lynette’s Secret Garden project is different and beautiful I love the vibrant colours and the dark and light shades of thread are beautiful and the beads enhance the overall design. A lovely piece of embroidery. I’ve just looked on the Secret Garden flickr photos they are all so lovely and so diverse in colour, threads and stitches beautiful work. Thanks for sharing this with us Mary. Wow that’s a lot of miles and a lot of driving I hope you had a nice time. It’s nice to go away especially visiting family, but it’s good to get home to familiar surroundings. I hope your family are well. Wow, Lynette! Your project is so. . .happy! The fun, vibrant colours, the stitches, the beads; I think it’s wonderful! Nice work! Enjoy your weekend, stitching friends. The first thing I noticed on Lynette’s piece is that this “Secret Garden” has a little figure secreted in the bottom center. The tendril eyes look straight at me. The head is resting on the leaf arms. The head is protected on both sides by leaves, and the lower portion of the body is also hidden by leaves. Is this a modern version of the Green Man? Or is it just a little elf that is hiding in the garden, waiting for the embroiderer to discover it? That’s lovely embroidery. A beautiful work of art. This project makes me want to dive immediately into chain stitching, something I haven’t done much of. I think it’s amazing how completely unique it is to the other versions of the project we’ve seen. It just goes to show how personal embroidery can be. BRAVO!